Kids For Peace, awarded the Fete D’Excelence Gold Medallion, is a living growing international interactive arts program committed to developing the important threads of inter-group cooperation that is essential for peace and co-existence among human beings worldwide. Families and kids have the opportunity to explore the creative process and celebrate their rich ethnic diversity with free quality educational inter-media arts workshops. People of all ages and gender,come together to work on these projects to create art that is meaningful to them and the viewer. 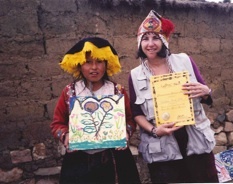 Gayle founded Kids For Peace with collaboration from the Center for Jewish Culture and Creativity in 1995. The program was exhibited and honored at the Palais Des Nations in Genva, Switzerland for it’s value to education in order to diminish violence and injustice. Gayle brings to this project her experience in coordinating and directing international large scale community based art activities. 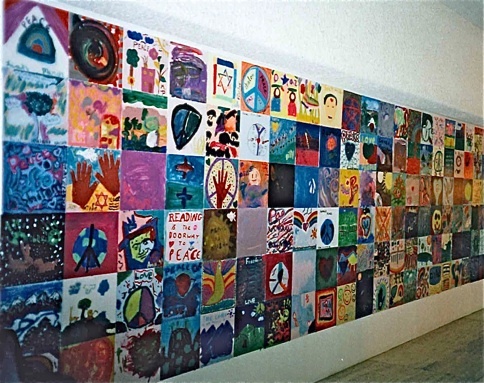 Kids For Peace is seeking collaboration with schools and organizations that have a similar purpose. 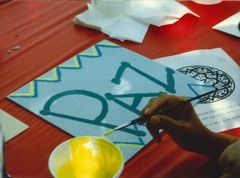 This project is funded by individual donations and grants. Your tax deductible donation to one of the above foundations will help fund future Kids For Peace workshops and thereby cultivate human beings to become caring creative leaders in any aspect of the private and public life.